In a dispute that began 18 months ago, five train operators are stripping public safety measures and equal access mechanisms for disabled people and the elderly. Under a pretence of upgrading infrastructure, train operators Southern, South Western, Greater Anglia, Northern and Merseyrail are shifting safety critical roles from the advantage of hands-on conductors to a system of closed-circuit television screens accessible only to the driver. A hazardous system particularly in low-light and on busy platforms. Additionally, vulnerable passengers are no longer guaranteed assistance, unless booked 24 hours in advance. On board staff are trained to help elderly and disabled people access rail services in lieu of unstaffed stations - seven out of every ten South Western Rail station is unstaffed, exacerbating this scandal even further. Although the Rail Delivery Group, speaking on behalf of the operators, condemn the industrial action, only two years ago it said: "It is conductors who are best placed to ensure that assistance is delivered effectively and in accordance with the law. A key risk area is availability of help in getting off a train". Safety regulators have signed off on the operators' strike-breaking plans. Much of it amounts to haphazardly training people with no experience to cover for highly trained guards. This comes in light of the recent discovery that Greater Anglia's training of 'replacement staff' was deficient - when a scab replacement guard opened doors on the wrong side of the train October 5th out on to open track. With operators switching to driver-only operated (DOO) trains, the industry, however, regards the conductor's job obsolete. Even General Secretary of ASLEF and member of Labour's National Executive Committe, Mick Whelan, had been working with Govia Thameslink Rail to extend DOO trains on Southern Rail. 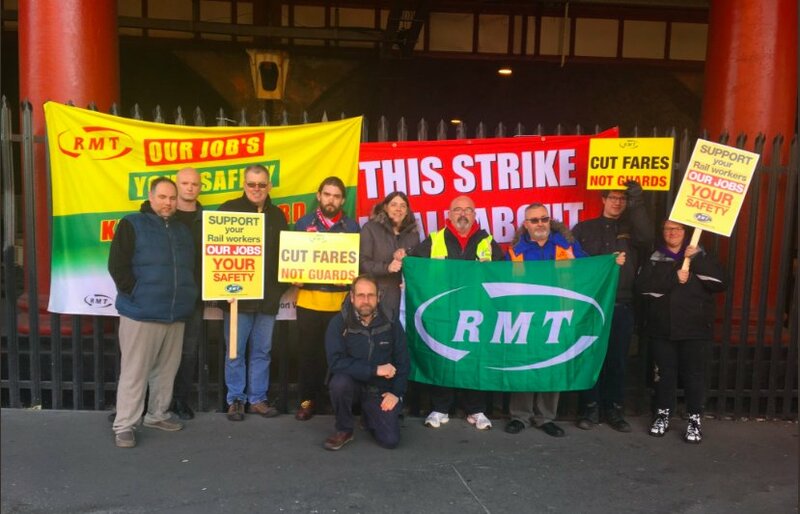 The same members of ASLEF striking alongside RMT members are now being bribed with pay rises to sit out the strike although Not About the Doors has reported that 193 ASLEF drivers on Southern Rail refused to accept the deal. Unfortunately, General Secretary RMT, Mick Cash, has attributed this assault on conductors to "foreign-owned rail companies" who are "robbing British passengers" shipping profits "across the channel" in order to subsidise foreign passengers. Although these narratives are becoming increasingly common on The Left, it is extremely unlikely that the fate of conductors will have been any different had the rail company been originally incorporated in the UK. A statement from Mick Cash on a previous strike against DOO on Virgin Trains East Coast mysteriously didn't mention 'foreign-owned rail companies' - because of course Virgin Trains is incorporated in the UK. The idea that Virgin Trains subsidises the British economy would be laughable so why make that claim for Abellio and Germany? If TFL started running American rail franchises and investing the profits into the UK rail and tube system would we see complaints from British unions about TFL robbing American passengers? This comes off the back of TSSA union and Momentum (the membership organisation set up following Jeremy Corbyn's successful Labour leadership election in 2015) argued a similar line earlier this year when they released a video featuring gloating EU citizens describing how they were profiting from British taxpayers subsidising their nations' railways. Both the TSSA/Momentum video and the RMT statement needlessly use chauvinistic nationalism at a time when millions of EU citizens are currently unsure of whether they'll be able to stay in the country after Brexit. They don't need the left to join in stoking the flames of prejudice. The trade unions and the Labour Party consistently reach for national chauvinism in order to bolster support for national capital, pitting different groups of workers against each other. Jeremy Corbyn, while critical of Southern Rail, fell short of condemning Driver Only Operation, instead saying "I would want that franchise brought back into public ownership and the public sector. After all, we provide the rails, we provide the trains and they make the profits from running them". Whether a Labour government would support striking workers while in power can be assessed by looking at Ken Livingstone's record as Mayor of London, when he told RMT members striking against TFL to cross picket lines. Yesterday, Shadow transport secretary Andy McDonald sent a letter to rail operators saying that a Labour government would put a halt to any future plans to roll out Driver Only Operation. Absent from the letter was a committment to roll it back, since DOO is already in operation on some services and may be on more if the current wave of strikes are unsuccessful. We 100% support fights against high fares, underinvestment, overcrowding and all the other problems on the UK’s rail network, but reject any attempts to pin this on ‘subsidised foreign passengers’, the fight is against rail operators and the state, not with the working class of other countries. What matters in disputes is not the nationality of the capital, or whether the company is nationalised, but the strength of workers against their employers. Meanwhile as the RMT leadership takes a nationalist angle, press coverage as always focuses on disruption to passengers. Not the disabled passengers who'll need to book 24 hours in advance if the changes go through, but commuters facing disruption due to the strike action itself. It has been left to workers and passengers themselves via self-produced media to get this message across. Only RMT members on Southern, South Western and Greater Anglia will be taking strike action on Thursday 9 November. All these operators run services into London.